At times, it can be hard to find a running shoe that meets your requirements. One that provides excellent support, stability, and comfortability without sacrificing anything important. The GT-2000 2 boasts that it accomplishes exactly that. ASICS redesigned many of the core features found in the GT-2000 and says that they have improved every aspect of the shoe. This includes making it lighter, stronger, and more flexible. 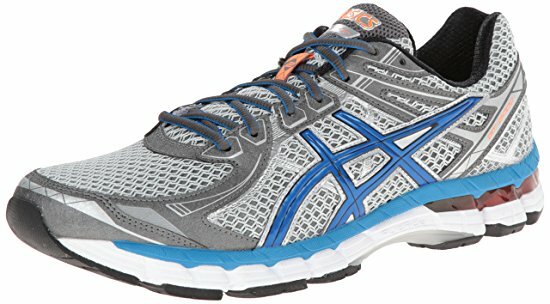 In this ASICS GT-2000 2 running shoe review, you can expect to be provided with unbiased information on the product. This includes the advantages and disadvantages of using it, as well as the features and specifications of the running shoe. There is no doubt that the GT-2000 2 is a widely-used running shoe. The reason being that it has some admirable features and innovative design features. The impact guidance system included with this shoe operates using linked componentry that promotes and enhances natural movement. This provides increased stability and helps you maintain correct posture while running, whether you are on rough terrain or the sidewalk. ASICS employs FluidRide technology in the GT-2000, which provides a unique combination of cushioning and bounce back properties. This, paired with the reduced weight and excellent durability, can greatly reduce the risk of damage to your joints. The dynamic DuoMax support system that was utilized in the original GT-2000 was improved in order to provide even more to the user. This includes increased stability and support, as well as reduced weight and enhanced platform support. A specialized guidance line system uses vertical flex grooves to decouple the tooling in the route of progression, ultimately enhancing your current gait efficiency. The forefoot and rearfoot GEL cushioning built into the GT-2000 2 attenuates shock during the collision and toe-off states in running. Alongside that, it allows greater flexibility and movement in multiple planes as your foot is transitioning through the standard gait cycle. The guidance Trusstic system supports the guidance line construction to greatly improve overall gait efficiency. It also provides increased midfoot structural integrity to the user. The GT-2000 2 is made to be lighter than the original GT-2000 while still providing the same features and support. This reduces the force of impact, and the stress on your joints during a run. In combination with some of the other features included with this shoe, you can expect improved efficiency while running. This lightweight running shoe is manufactured to provide increased overall stability, support, and comfort to the user. In combination with the specialized technologies it utilizes, this shoe promotes good running posture and prevents joint damage. There are many reasons as to why you should purchase and use these shoes. Although, in the end, it depends on your own personal preferences and expectations for a pair of running shoes. These running shoes provide the needed support for those with plantar fasciitis and similar conditions. If you are looking for a fairly inexpensive, but high-quality pair of running shoes, these are the ideal choice. If you require increased comfort and stability while running, these may be for you. The ASICS GT-2000 2 provides excellent shock absorption to reduce the risk of joint damage. They aim to improve your natural running posture in order to reduce the effects of overpronation. Increased support and stability during use. Highly durable design and materials reduce the risk of damage to the shoe. Gradually improves posture while running. Properly supports individuals with plantar fasciitis and a tendency to overpronate. Provides extra resistance against knee and joint damage. Inexpensive, while still providing greater quality than similarly priced running shoes. Smaller than the size states. When purchasing, you might want to get half of a size larger. Pieces of the sole come off after a few years. The majority of customers who used this product have reported that it is a huge improvement over the original GT-2000. Some even go so far as to say that it is better than the newer GT-2000 3. Customers who had been shipped shoes with defects were able to promptly return and replace them. The most prominent issue reviewers had with these shoes is that they were a bit small. After figuring this out, they had them replaced with a pair roughly half of a size larger. Some customers complain that after a couple years of use, the soles began to fall apart. This can be a major problem, but in most cases this did not happen, and the shoes lasted for multiple years without any damage. In any case, these running shoes are fairly affordable and easy to replace in the case of degradation or damage. In conclusion, the ASICS GT-2000 2 is widely regarded as one of the best pairs of running shoes available for the price. They usually last for multiple years, even if they are used every day for long periods of time. They are fully recommended for anyone with flat feet, plantar fasciitis, or even just mild to moderate overpronation. Reviewers have reported very few problems with the shoes or their manufacturer and defective pairs were easily replaced. They are undoubtedly designed with the utmost quality in mind, and boast many innovative technologies and features. If you are looking for good running shoes on a budget, have plantar fasciitis, or a tendency to overpronate, these shoes may be exactly what you need. They are affordable, high-quality, and provide an abundance of support, stability, and comfort to the wearer. All of which is done without sacrificing any key design aspects, or the shoe’s aesthetics.